Yeah.. the internet sure is an addiction. Facebook most of all, It’s my main source for answers when I have questions, going from a good movie to other more important stuff. 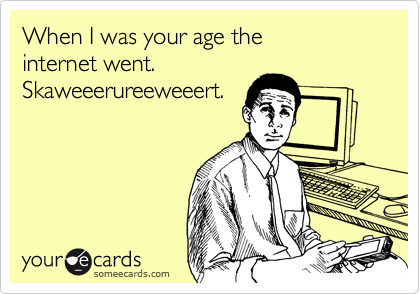 Hi MP, well I’m 17 years older than you and I remember life before the internet. Sometimes it seems like it was simpler and better but I guess all “old” people long for the “good old days”. Some day, this will be your “good old days” too, so relish them! Your absence was noticed by me. For the record, and all. I deactivated my account several years ago. I was off Facebook for at least a year. I’ve also given it up for Lent on more than one occasion. I will more than likely give it up for Lent in 2013, too. Lately, with the election, FB has frustrated me more than inspired me. FB has been a platform my so-called friends used to spew hatred and negativity. I don’t understand it, Angel. If I were in a room with these same people, they wouldn’t act that way. I don’t like how social media really changes people. Makes me wonder if my friends are ‘real’ online or offline. Oh Lenore, my sentiments exactly! Part of me wishes I were on FB last night (since I have no TV) and then part of me is so glad I wasn’t!! Today too. Thanks for noticing I was gone! I’ll keep blogging as long as you do, deal? I wish you’d give me your new blog address with your buddy since I don’t have it written down anywhere. Funny you should ask for the address of my co-blog. She and I are talking about writing a blog about social media and kindness. In fact, I copied my comment and emailed it to her. Not sure when we’ll get the post up – but it is officially a work in progress. Hi Lara! I’d love that too. What!! No more cute pictures of EK? I guess i will have to come for a visit. Love ya. I thought you had blocked me…lol. Kuddos for pulling the plug. I keep telling myself I need to do the same. Right now I have Shabby Gypsy to use as an excuse to keep my addiction. That may change after the first of the year though. Oh Michelle, I’d never block you, well unless you make me mad, then maybe. 🙂 Yes, I got a little booth for my Emma Kate’s clothes so I’m just trying that route instead. I’m going to keep blogging pics of EK, so check back. Guess this is the first time I have replied, I love reading your stuff especially about your Dad and the way y’all grew up, I hope you keep your blog going, and I will miss ya on FB. Thanks Wesley. I plan on keeping up my blog, it’s got too many memories here. I miss you on FB too! as well. Whatever your decision, you and your family will always be dear to my heart. I admire your taking on a challenge and doing what is best for you and yours! P.S. you’ve got my email .. email is good 🙂 Until next time … Donna H.
Yes, I’ve heard of those things happening out there too. FB can be good and can be bad. Thanks for sticking around 🙂 Hope you enjoyed the fall foliage. I hope I never give up my blog! Thanks Deborah!